In many ways we cannot be more happy how things are going with Jenga. We are running now since two months the shop in Michamvi and even the groups are surprised with the amount of orders we have placed the last two months. Mainly because of our lovely shopkeeper Sarafina, the top location and the set up of the shop, our buyers really get the change to see the products of all the groups in it's full glory! We cannot be more excited and more happy with the future ahead of us for this shop! The shop opening was because of the arranging talent of partner Mrisho a great succes. Almost all the groups from all over Zanzibar were there to represent themselves! Unfortunately there is also less good news. We decided to close the first JENGA shop in Nungwi. The reason is that the shop keeper and partner Said decided to choose a different path, her-for it was no longer possible to keep the shop well maintained and up and running. We hope before the end of this year, beginning of next year to open another JENGA shop in Paje... keep you posted! Back to the good news! Soon JENGA will be found in Asia. There will be a jENGA JAPAN webshop. We found 3 Japanese partners very interested in Jenga and we are very proud that they want to represent us in JAPAN! Masashi & Tsukasa thanks very much for your support this month. If your are interested please send an email to; info@jengazanzibar.com. YOU AS A HOTEL OWNER in Zanzibar can also have your own JENGA SHOP! 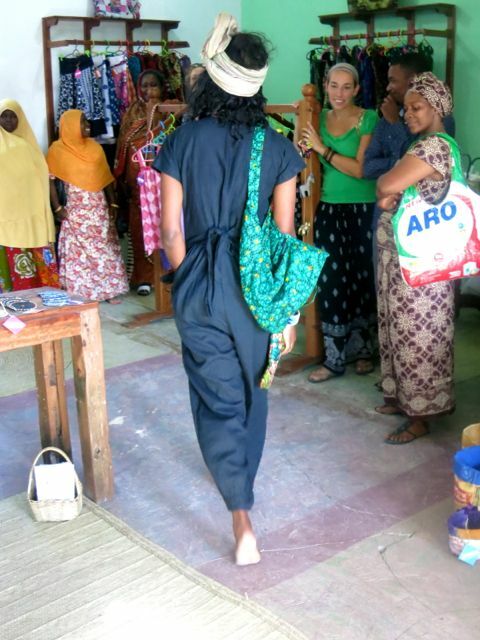 Thank you for your support, thank you beautiful people of Zanzibar to make us smile with your beautiful craftsmanship! Melanie & the Jenga team.. The purpose of founding AfriCraft was to provide to local craftsmen better chances to manufacture and market their products. In this view AfriCraft wants to support the domestic handicraft production, to contribute to the improvement of the quality of hand made products, to safeguard culture of the tribes in Tanzania by promoting their traditional works, to help financially craftsmen and artists in strengthening their skills and to offer materials and equipment to needy producers. A major activity of AfriCraft is to introduce new product designs. We believe that innovation will create more work and generate more income for the producers and their families. It is the wish of AfriCraft to support the creation of a national designer centre for Tanzania. AfriCraft is operating an own workshop and cooperates in addition also with many producer structures throughout the country. Totally they provide income to 120 artisans and their families. A main concern of the organization is the protection of the environment. In this context the project ‘Crafts for environment’ has been started. Under the slogan ‘ re-create’ fantastic products are designed and re- produced: drinking glasses and tea lights from glass bottles, bags from waste paper, gift items from cans – just to list a few. With Dana, Eva & Nicoline a big Jenga banner and lots of products we showed Jenga to the big audience of these great cities. The sales was enormous, little under 1000 euro turnover in one day in the two cities says how populair the products were. The sympathy from the people for what we do was said so many times that day that we can only conclude one thing; we come back every KINGS DAY! Then we decided to organise a pop up store in my house in Holland. The reactions were so positive and the sales was great! What was good to hear is that people don't only appreciate the story of the maker that Jenga is trying to tell but also appreciate the quality of the products. Also the group of women that came to shop vary in age and style but for all of them there was something to find that they liked! Soon to come; AFRICRAFT they will get a special item on News & Events. Not sold in Zanzibar before but in Holland such a great succes that all products we had from Africraft were SOLD OUT! We can tell you it's not just jewelry...... we think it's ART! 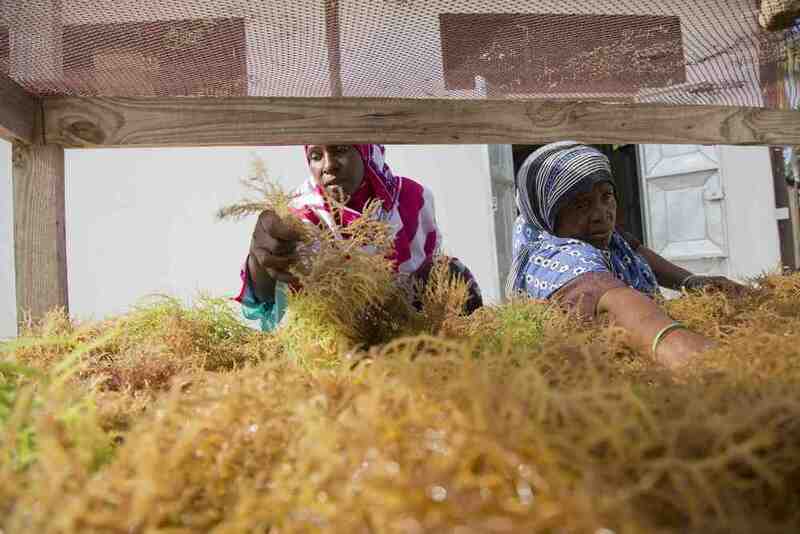 The Seaweed Center is located in Paje, Zanzibar. It is an entrepreneurial social business that provides local women the opportunity to earn a living by harvesting seaweed and creating beauty products. Their product range is 100% organic, using the highest quality ingredients, and lovingly handmade by local women on the shores of Paje. Hotel soaps, souvenir soaps, body butter, body scrub and massage oil, all their products are handmade and produced by the Seaweed farmers of Paje at the production site. In order to support the factory and help promote entrepreneurial social businesses, they provide tourists the opportunity to visit the center and take part in the daily activities. The guests can join for about 2 hours and learn about the soap-making process, immerse themselves in local culture and be pampered with a traditional Zanzibari welcome, that involves a purifying ritual, fresh seaweed juices, and a walk on the beach, where they can learn about seaweed farming. The ladies (or the 'mamas', as they call themselves), are a vivacious and boisterous group of ladies, well worth the trip! If you visit Zanzibar don't forget to visit the Seaweed Centre in Paje! First of all we are proud of the new groups & individuals that we may represent as JENGA. The first one is CHAKO. Chako works according the Tourist2Tourist aspect. CHAKO makes souvenirs for tourists, out of waste material that comes from the tourism industry on Zanzibar. The CHAKO jewelry already is selling very successfully in the Jenga shop in Nungwi & in the different shop in shops. In one of the shop in shops it's the best selling product of their boutique. Read more about Chako at ( "Meet the Maker"). Going around Stone Town one day i stopped to have a great lassie at Luiz her restaurant. She is my friend since i have been living on Zanzibar. That day she suggested me to contact Teresia, who she said made beautiful jewelry. Every now and then everything in life comes together at the right time. Teresia just happened to pass by the restaurant and Luiz jumped outside to ask her to get inside. Teresia is well in her 60ties but she has got the sparkle of a young woman. Her story is as many of the stories of the women we meet.. single mother of many children has to make a living for herself and her kids. Teresia found her niche designing jewelry using materials with a very special history specific to Zanzibar. Read more about Teresia at ("Meet the Maker"). Have a great week! Melanie & the Jenga team. FIRST things first; THANK YOU SO MUCH/ASANTE for donating so much money. The total amount of 490.000 TSH is well spent!! WOW that is so much appreciated... The roof is repaired but unfortunately the ceiling was soaked and came down damaging all the electrics aswel. Until monday the 3th of March they will be busy with the new ceiling. We will pub lice the receipts of the material that is bought with your money once the job is done, but here an update and the new roof that THANKS TO YOU is a fact! We expect to be open again 7 March. Said, Asma & the Jenga Team. Zanzibar where the sun is always shining! In all seven years i have been living here i have never seen so much rain, storm and wind as in these last two weeks.. Especially not in February! Unfortunately 2 people lost their lives due to this storm and together with many other hotels and places in Nungwi, also the Jenga shop in Nungwi was affected. The complete roof was blown of during the first night of the storm, and the ongoing rains made sure that the simple ceiling became soaking wet. Asma & Said were able to store the products in a safe place. Now they are left with picking up the pieces & organizing a new roof. Out of the savings of Jenga we were able to pay some of the cost but unfortunately we can not cover all the cost because there are simply not enough funds to do so! For Said it's sad because he has to use his own savings to restore the roof and he has to start all over again.. If you want to help please contact us or go directly to the page where you can become a ambassador. We will make sure your donation goes to rebuilding the roof of the Jenga shop in Nungwi..
Meet Ushindi & their fantastic products! Ushindi is the Swahili word for OVERCOME- Their goal is to enable women of Zanzibar to overcome their challenging circumstances. 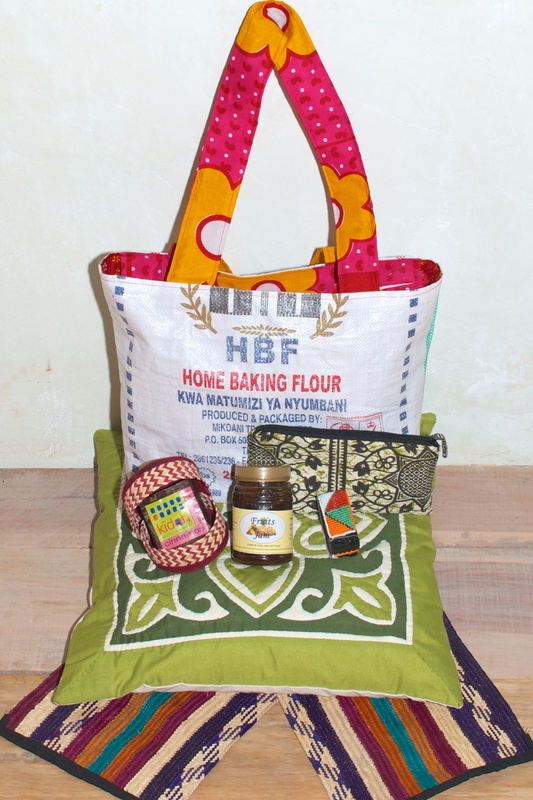 Ushindi, founded in 2011, is a cooperative that teaches women to sew quality handmade products made from beautiful ' kitenge' fabrics. Currently their assortment consists of; bags, wallets, accessories, and assorted clothes. They continually develop and innovate their creative, high quality product range. Now different JENGA products to be ordered online on this fantastic dutch webshop of LLEF! We are very proud that the Dutch can order & buy the products of the Tanzanian maker. Martin was born on 9-9-1984 in Shinyanga province, Tanzania. He completed primary level in school. Due to financial problems he was not able to go to secondary school. In 2005 he decided to learn how to be a designer through a local tailor. He paid to study with the local tailor for 5 months and was taught how to make many different kinds of clothes. After this period he practised mending clothes by himself as much as possible. Presently he knows how to design and make many different things, including laptop covers, caps, bags and much more. Besides his work as a tailor, he also works as a night watchman for a steady income. His dream is to be able to provide for his family by working as a full time designer. MARTIN with his latest product; laptop bags made out of used kites! Zanzibar watersports festival September 2013! What a great beach event & we were proud to be invited to introduce Jenga to the local people of the area, to the hoteliers & tourist enjoying the event.. We met a lot of nice people & made a interesting connections to move Jenga forward! Salama & Melanie enjoying the beach shop! 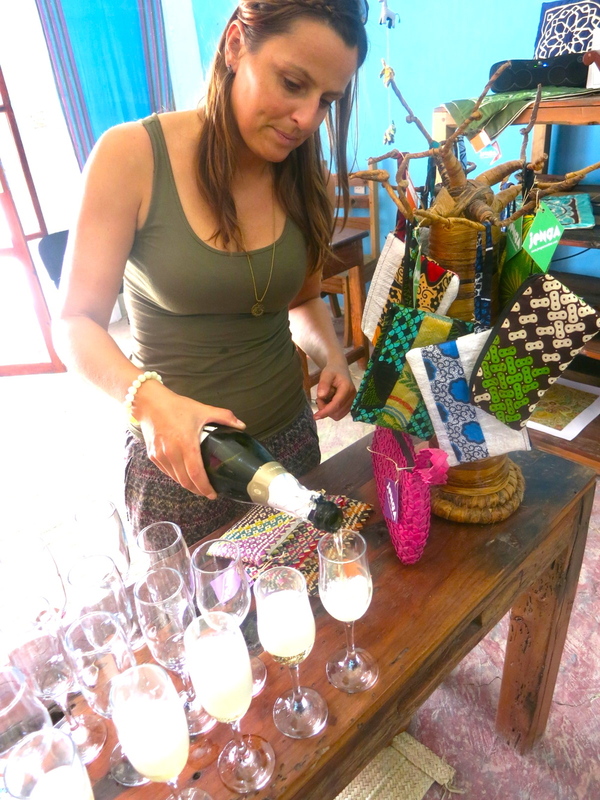 Sasik in the color of the indian ocean..
Jenga's Shop Opening part 1; champagne & the first guest! Official shop opening in Nungwi on 24th August!! Jenga's first shop in Nungwi opened in July 2013! Jenga's big dream; To built A SHOP/WORKSHOP & CAFE in Paje will not come true just yet in this year! We are working hard to get enough funding, but this takes time..
Do Good, buy a do-good-y-bag! By ordering a JENGA DO GOOD-Y-BAG you support the local community directly! While you get a taste of our great products, we make sure the makers get a fair price. - 50% is going straight to the makers. - 40% is going straight to the JENGA account for the Jenga shops. - 10% is to make sure we can cover the postage and packaging costs. 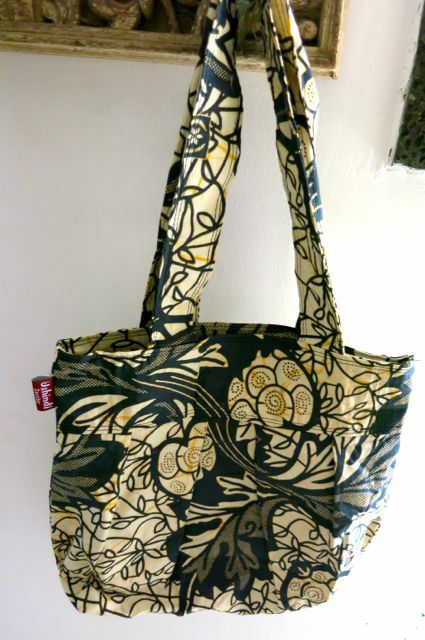 Send an email to; info@jengazanzibar.com with your address and the bag will be sent to you as soon as possible! THANK YOU FOR SUPPORTING JENGA!